HILLARY KLUG: Jack Daniels whiskey may be the most well-known export from the small town of Lynchburg, Tennessee, but Hillary Klug is moving up fast. 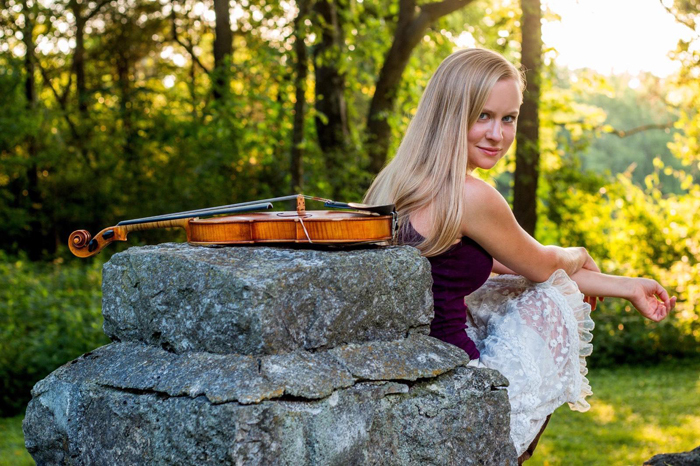 There are many virtuoso fiddle players on this Earth, and many accomplished professional dancers, but precious few who can do both simultaneously, and that incredibly rare combination has earned her critical acclaim, honors and fans around the world. In fact, Hillary is now an internet superstar, with her most recent viral video viewed almost 50 million times in only a couple of months. She also now has a huge Facebook following of almost 350,000 fans. Hillary started to dance at age 8 and picked up the fiddle at age 13. Her parents made her pay for half of her first fiddle with the promise that if she ever quit, she’d have to pay them back. That turned out to be a great bet – she soon started playing weekly square dances, went on to become a National Buck Dancing Champion and Kentucky State Dance Champion, performed on streets and stages from Ireland to Brazil, and released her debut album last year. Hillary is also featured in a UK independent film titled “Country Music.” 2019 is her biggest year yet, with another record in the works, and international touring and festivals to show the world her impressive talents.